In contrast to the ever-changing face of western civilization, Stann Creek in Belize remains as it has been for thousands of years. Located just south of Dangriga, near Hopkinstown, the Preserve is a pristine natural wilderness that spans from the coast of the Caribbean Sea up into the Maya Mountain highlands. 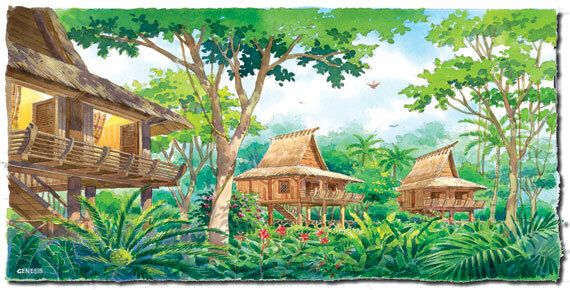 All Pines will consist of 40 treehouse villas built by native Maya craftsmen on a peninsula straddling the Sapodilla Lagoon and the Caribbean Sea. Access will be by water taxi from the mainland. Each villa features a cistern and open ventilation. The hotel is completely off-the-grid with zero impact on the land.